northumbrianpipers.org.uk • View topic - Amplifying Pipes? 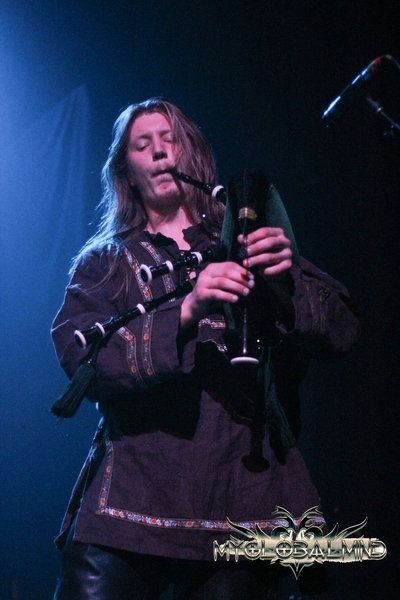 Does anyone have experience of playing Northumbrian Smallpipes through a PA in a band? I play in a Ceilidh band and would like to start using the pipes (in addition to mandolin and whistle) but can't see how to mic them up or fit a pickup. I know this is an old post, but it could still help. I've seen some people use amplified pipes before. Specifically the Russian folk-metal band Arkona. As you might imagine the piper has to compete with the loud volume of that kind of band. It looked like he had a clip on mic with the end over the finger holes. I'm not sure if he used any mic for the drones, but it would probably be a good idea. The other mic you see on the stand is use exclusively for the flute I believe. So I would tie one of those clip on mics and suspend it over the middle of the chanter with enough room to move your fingers, and another one from the end of the drones. Whoever runs the soundboard or pa can adjust the volume to get the right balance. This post is a bit old but I've just joined the forum so I thought I'd throw in my two penn'eth. I used to play pipes in a folk rock band in the late '80s, early '90s. Trying to be heard over the drum kit and electric guitar via two mics was a nightmare of feedback for me and the mixer! I turned a new chanter stock a bit longer than standard and inserted a wee electret microphone into a hole I had drilled into it above the reed. I had the circuit board, the battery and the jack socket attached to the inside of the bag cover. I thought I'd have to do the same thing to the drone stock but they were perfectly audible with just the chanter stock mic. The microphones are dirt cheap and the circuit is very simple.